Barbara Griest-Devora lives near downtown San Antonio, Texas, with her husband and two children. She teaches English at Northwest Vista College. Her poems have appeared in The Ledge, Rhino, The Texas Observer, The Sycamore Review, Cider Press Review and other literary jornals. 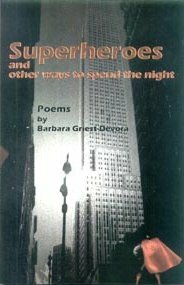 "Barbara Greist-Devora's first collection of poems opens us wide and raw to this 'world of light / and heavy longing.' 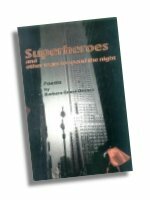 From the poignant lyricism of "Monogamy" and "In a Room Where You Are Staying for Only a Week" to the wry humor of 'Getting It" and the dark comedy of "Climbing Man," these captivating, haunting poems offer wisdom far beyond the hilarity of Greist-Devora's cast of superheroes, who are, of course, ourselves." and every waist in the room smaller than your own. for no reason but to point out she has them. and business girls with clunky heels. of backs. It was enough to make a heroine go mortal. keep her hands and slender fingers to herself.